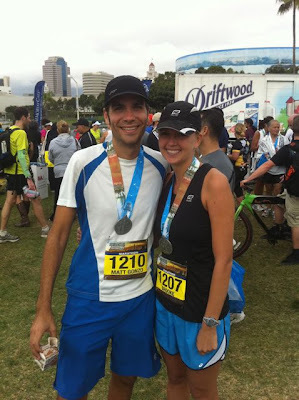 On October 17, 2010 I ran my first ever marathon: the Long Beach Marathon. I smiled, I cried. It was an incredible experience. Once I hit mile 20, the next 6.2 were extremely difficult. Mile 24 was the hardest one for me, and it was also my slowest mile of the race at 10:05. Once I finished mile 24, I just really focused and knew I could make it to the finish. This was one of my proudest moments as a wife. Matt ran the marathon injured (runner's knee), which meant that he had to relinquish his initial time goals for himself, and instead just have the goal of finishing. He ran most of the race in pain, but he did it. I was so glad to see him cross that finish line. Next time, I know he will leave me in the dust. I held myself together until I crossed the finish line, and then I started crying. Not from pain, just from the overwhelming emotion that came over me. 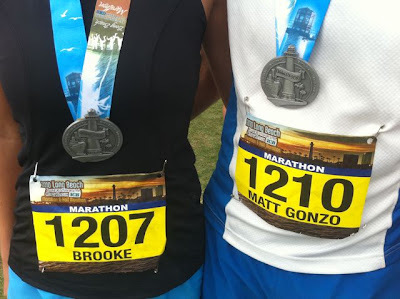 I didn't expect the experience of running a marathon to be such a beautiful thing. I would seriously recommend that every person run a marathon at least once in life. It is such an incredible experience that demands a person to reach into the depths of their emotions and physical ability. I finished the marathon in 4:03:55 (9:19 average pace). (According to my GPS, I ran 26.62 miles at an average of 9:10 pace. There was definitely a lot of weaving around people in this race which is probably why my GPS said I ran further.) I was ecstatic with my finishing time and far exceeded the goal I had set for myself. "For the record, you were ahead of about 67% of men finishers." "From mile 18 to the finish, you passed 154 marathon runners and 23 passed you." Not bad for my first marathon. Finishing a marathon is kind of like Christmas as a kid. You spend so much time looking forward to it, and when it arrives, it seems to go by pretty quickly. You enjoy every experience, emotion, twist and turn. Once it is over, you kind of go through a slight depression because you are not sure what to do with yourself, so you start to build up the anticipation for next time. 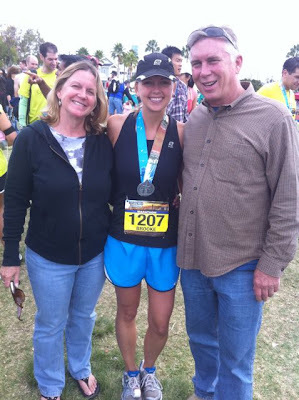 My next major race is the Carlsbad Half Marathon, which takes place 90 days from today. After taking 5 days off from running, I am slowly getting back into it. Still thinking about what my next marathon will be, something in the spring. Anyone want to join me? I would definitely recommend the Long Beach Marathon to anyone looking for one to do. I thoroughly enjoyed it, and would even consider doing this marathon again next year. 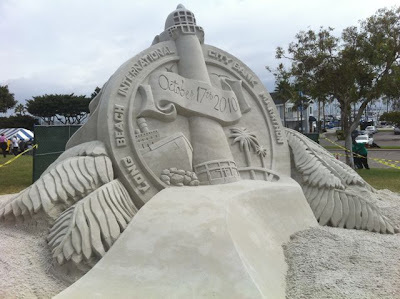 Great things about the Long Beach Marathon: flat course, great weather (overcast), people cheering throughout, good porta potty placement, good water stations, free cliff gus at 3 places along the course, mostly pretty course, nice medals and shirts. 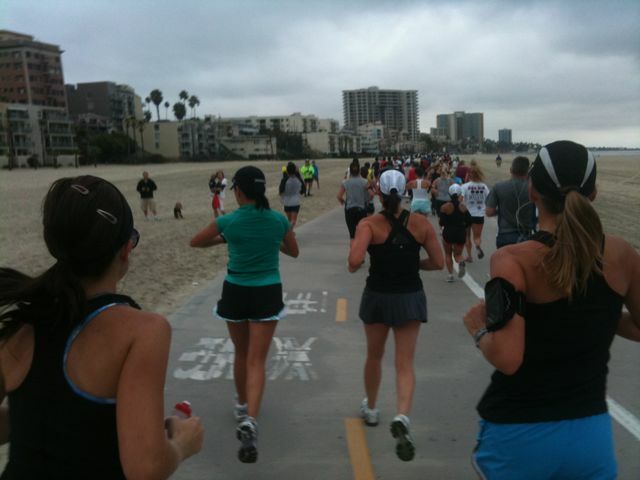 Frustrating things about the Long Beach Marathon: The marathon and half marathon starts and finishes at the same place. This made for a very crowded start, which made it difficult to line up with your pace group, even though we arrived to the race early. Because of this, there were a lot of people walking during the first mile that I had to weave around. I can live with having to weave around walkers in the beginning of a race, but not miles 24-26 at the end of a marathon. I finished in 4:03, and there were still people finishing the half at that point. The last 3 or so miles of the course are for half marathoners and marathoners, so I ended up having to weave around many half marathon walkers at the end. I was beyond exhausted at this point, so a little beyond frustrated. I am not proud to say it, but I actually elbowed two people who were part of a human chain of walkers taking up the width of the course.